A lot of home brewers are familiar with the term “Noble Hops” which refers to four variety of continental European hops originally grown in Central Europe. The four hop varieties are Terrnanger, Spalt, Hallertauer and Saaz. This week we take a look at these popular hops and character in detail. 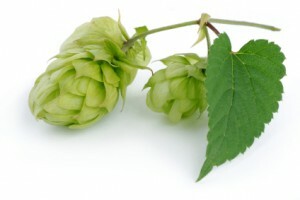 The four traditional varieties of noble hops are properly characterized as aroma hops as they have relatively low alpha bitterness, but are highly aromatic. They are widely used in traditional continental beer styles including Bohemian Pilsner, Oktoberfest/Marzen, Dunkel, many Wheat/Weizen beers and other lagers. They generally do not store well. From a hop analysis view, these hops have high amounts of the hop oil humulene. Humulene is a fragrance often used in the perfume industry with an aroma that has a robust earthy, woody and herbal character. Oxidation, heat and light rapidly break down humulene, which is why noble hops are susceptible to degradation if not properly stored. Relatively low alpha acid levels (generally 3-5.5%) add aroma and bitterness without becoming harsh. The low amounts of harsher tasting beta acids (lupulone, adlupulone and colupulone) contribute to the desirable flavor of noble hops. Many also have a slightly spicy finish which adds to the character of beers like Pilsner. Tettnanger (Tettnang) – A hops from Tettnang, which is a small town in Southern Baden-Wurttemberg Germany. It has a mild, slightly spicy, floral character and is genetically similar to Saaz grown in the Czech republic. It is highly valued as both an aroma and flavor hops and is exported worldwide for use in Belgian ales, French ales, Bocks, Lagers, Pilsners and Wheat beers. Substitutes include Saaz and Fuggles. Saaz – Saaz is a hops traditionally grown in Bohemia and the modern day Czech Republic where it accounts for nearly 2/3 of hop production in the region. It is named after the Czech city of Zatek, which in German is Saaz. It has a distinct flavor that is mild, earthy yet spicy. It is the definitive hops used in Pilsner Urquell and Budvar, which are the basis for almost all of the most popular American lagers. However Saaz is also widely used in all types of lagers, pale ales, wheat beers, and many continential styles. Its closest substitute is a hop called Sladek, thought often Tettnanger, Lublin, Ultra or Sterling may be used. Spalt (Spalter) – A traditional hop from the Spalter region of Germany south of Neuremberg. It is grown in a fairly small acreage and not as widely distributed as other noble hops making it somewhat difficult for home brewers to obtain. It provides a mild, slightly spicy flavor with a strong noble hop aroma. Note that Spalt is not the same as the more widely distributed “Spalt Select” which is actually a descendent of Hallertauer Mittelfruh. Spalt is used in many traditional German styles including Bocks, Alts, Lagers, Pilsners and Munich Helles. Substitutions include Saaz, Tettnanger. Halltertau (Hallertauer Mittelfruh) – Named after the Hallertau (Halledau) region in central Bavaria, it was widely grown in Bavaria until the late 1970’s when it was largely replaced by the Hersbrucker variety. A fungi called verticillium ravaged the Hallertau hop crop at that time. You will often see Hersbrucker sold as “Hallertauer Hersbrucker” though it is actually a Hersbrucker variety. Later Hallertauer Gold and Hallertauer Tradition variants (Also Hallertauer “Magnum, Merkir and Taurus”) were developed from Hallertau that were more disease resistant. The hop has a highly floral character, slightly earthy but without a very strong spicy flavor. It is used in both German and American lagers, and is known as a key flavor/aroma hops for Sam Adams Boston Lager. Substitutes include Hersbrucker, Mt Hood and Liberty. In addition to the four hops listed above (and their variants), you will often hear of other hops occasionally listed as noble hops. These include English Fuggles, East Kent Golding, (Hallertauer) Hersbrucker, and Styrian Goldings (a Fuggle variant). While none of these are actually true noble hops, they share many of the noble hop characteristics of being highly aromatic and having low alpha acid. Also due to the pressured of land usage in Central Europe, diseases and pests and the move of many commercial brewers towards high yield, high alpha hops (for hop extract), the supply of true noble hops has been steadily decreasing for decades. Growers are instead producing hybrids or variants such as Liberty (a cross of Hallertauer Mittlefruh with a disease resistant US hop) or Mt Hood (a higher alpha acid hybrid). Variants of the nearly noble hops above such as Willamette (derived from Fuggles) are also widely grown in the United States. Thanks for joining me on the BeerSmith blog. If you would like weekly articles delivered to your inbox, sign up for the BeerSmith newsletter. Also check out the BeerSmith Podcast which is published every other week and available as a subscription on iTunes. Just wanted to let you know I referred to you on the latest blog post for Prost Brewing’s blog. I referred to you for this article on noble hops. Nicely done! Prost Brewing is located in Denver CO. Stop by if you ever have time! It is a classic German beer hall with classic German beers!